Jomsom Muktinath is one of the most beautiful places in Nepal. The Mustang region is famous for the various landscapes it comprises of including the world’s deepest gorge of Kali Gandaki River. 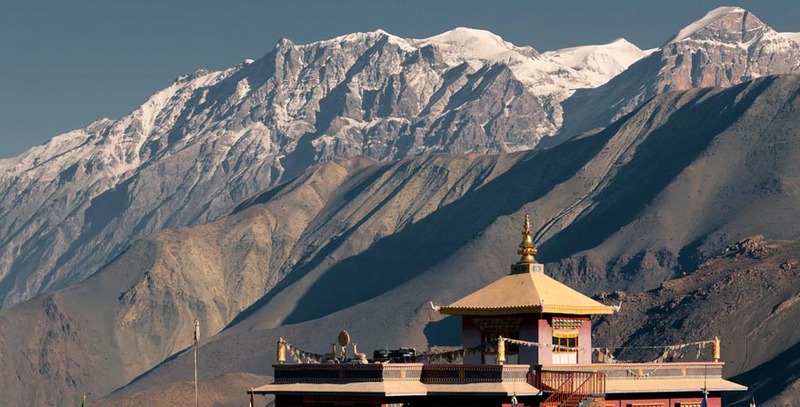 Its famous Hindu and Buddhist pilgrimage in Muktinath and breathtaking views of the mountains. Any people with good fitness can do this Jomsom Muktinath Trek. Bharal Adventure Pvt. Ltd. team traveled to this place for the betterment of the itinerary. Therefore, if you choose the Jomsom Muktinath Trek with us for the advanced and high-quality trekking in Nepal. This part of the Annapurna region can also be covered during Annapurna Circuit Trekking. 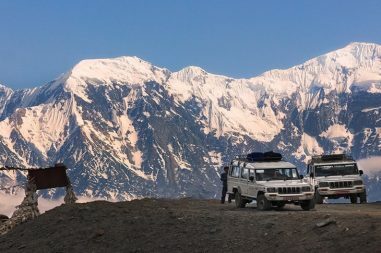 As you move along the Kali Gandaki River, you marvel at the glorious peaks of Annapurna –I and Dhaulagiri, both exceeding the heights of 8,000m. This journey is a chance to explore cultural, natural, spiritual and historical sites all in one. This together gives you a splendid vacation in the Himalayan Lapland. Finally, Muktinath temple will give you a sensational felling you were looking for. Imagine the amalgamation of the culture, nature and religious beliefs in one single trip. The nunnery with the ever flaming natural gas light and the memorial chortens provide the amazing harmony between Buddhism and Hinduism. Hence, Explore the hundreds of year old monastery, caves, local tribes and their culture, local wines and delicacies. Diverse landscapes and mesmerizing views of the mountains as you walk up and down in one of the best regions in Nepal which is not only naturally and culturally rich but also have spiritual and historical significance. Travel with the local experts who are reliable for a worth it journey. Therefore, Bharal Adventure assures you best hospitality and quality services. We will be staying at 3-star hotels in Kathmandu and Pokhara and the best available teahouses during the trek. All accommodations are on twin-shared basis. Single supplement will be served on request and will cost an additional USD 350. Please understand that since you will be trekking in remote regions, the services in the teahouses will be basic. We will try our best to arrange rooms with attached washrooms; however, teahouses in some places do not have attached bathrooms. During our Jomsom Muktinath Trek, we can enjoy authentic Nepalese food as well as the more common international cuisine (Tibetan, Continental, Italian, Indian, etc.). Breakfast and dinner will be served from the teahouse or from a lodge menu where we spend the night whereas lunch will be served on the way to the next destination. All meals will be provided during trekking while only breakfast will be available in Kathmandu and Pokhara. There will also be welcome and farewell dinners for guests. For this trek there will be one leader, assistant leader (4 trekkers: 1 assistant guide) and Sherpa porters for carrying luggage (2 trekkers: 1 porter). This arrangement ensures that should anybody in the group get sick, the trip can still go ahead as planned. We can run the trek for groups of any size but we after years of experience we have found a maximum of twelve people to be the optimum size for a successful trip. However, if you'd like to book this trip for a larger group, then that can be arranged too. The Annapurna and Mustang regions are stunningly beautiful, but equally fragile. Future generations have just as much of a right to appreciate it as much as we do. Therefore, we believe that the tourism industry has an obligation to protect and preserve it. Bharal Adventure employs a 'zero impact' policy on the natural environment and the traditional communities that live there. Bharal Adventure, therefore, enforces a number of do's and don'ts. Please talk to your trek leader to avoid environmental impacts. Jomsom Muktinath Trek is considered non-risky in terms of AMS (acute mountain sickness) as the highest altitude you reach is 3,710m/12,170ft. Moreover, the gradual every-day ascent should help you acclimatize to the high altitude. Mild headaches, fever, loss of appetite or stomach disorder are important symptoms of AMS. You are requested to keep yourself dehydrated by drinking plenty of water. That combined with the gradual ascent should help minimize any AMS risks. But remember that some are more prone to AMS than others. Participants with pre-existing medical conditions such as heart, lung, and blood diseases should inform Bharal Adventure before booking the trek. Jomsom Muktinath Trek is categorized as an easy trek whereby your highest altitude will be 3,710m/12,170ft. Your will be walking for an average of 5-6 hours a day with a light backpack on this trip. The longest hours of walking is anywhere between 6-7 hours. Although categorized as an easy trek, it is important that this categorization is relative to other treks in Nepal. You are requested to train with light jogging and fitness routine at least three months prior to the beginning of the trek. High altitude trekking experience is an asset, but it is not compulsory. Anyone with a medical history is requested to consult their physician before booking the trip. Spring (March to May) and Autumn (September to November) are the best months for the Jomsom Muktinath Trek. Although this trip can be taken during winter, the cold temperature might not be suitable for everyone. This list is a guideline to help you pack for your adventure. Also understand that the items listed below will vary a little according to the season and the trek duration. Those items marked by an asterisk are provided by Bharal Adventure inclusive in the service. The weight limit for your luggage is 33 pounds or 15 kg. Remember that your luggage will be carried by your porter but you are required to carry a day-pack (with your valuables or anything important) on your own. We also suggest that you pack only what is necessary. A representative from Bharal Adventure will pick you up at the airport and take you to the hotel for rest. You could also visit our office if you are interested. In the evening, a welcome dinner will be hosted to introduce you to the Nepalese delicacies. The day starts with a guided tour to four of UNESCO World Heritage sites in Kathmandu that are Kathmandu Durbar Square, Pashupatinath Temple, Boudhanath and Swayambhunath (literally meaning “self-existent”) – The Monkey Temple. Early morning flight to Pokhara will be accompanied by the views of magnificent mountains such as Dhaulagiri, Manaslu, Machhapuchhare and five peaks of Annapurna range among others. Taking rest for a while, we will take a drive to Naya Pul from where the trek begins through the northern side of Bhurungdi Khola climbing through the sub tropical valley forests. We cross Modi Khola River through a suspension bridge to arrive at the village of Tikhendhunga. The trail from Tikhedhunga drops down crossing the Burungdi Khola from where it climbs all the way up to Ghorepani through the steeply up to village Ulleri. Ghorepani, which meaning “horse-water” in Nepali, used to be an important campsite for traders before becoming a trekkers’ stop. The place has small shops and stalls for selling local products and also lies at the higher altitude in comparison to the previous stop. There are two parts of Ghorepani, one in a saddle and the other a few hundred feet lower and it is at the first part that we stop to observe the enchanting views of surrounding mountains. Descending steeply to Sikha, a large village, we go down further to Ghar Khola Village gradually crossing suspension bridge it climbs up at Tatopani. The term Tatopani means “hot water” in Nepali. The place got its name from the natural hot springs located there. Following Kali Gandaki River, the trail goes down towards the gorge between the mountain tops that are only 38km apart continuing from there to Dana, Rupse Chahara (meaning a beautiful waterfall) and Kopchepani ascending further to Ghasa, a Thakali village which is considered as a paradise for bird watchers. Climbing up steeply through a forest will take you to Lete Khola gradually going further to Lete from where the trail continues to the east side of the Kali Gandaki river until you reach Larjung village. From here, crossing the trail through Tukche at 2,590m and apple farm projects, you arrive at Marpha village. Continuing the trail along the valley side rising gradually before crossing over a low ridge to Jomsom, we begin the trek from Marpha. Crossing the Panga Khola to reach Ekle Bhatti, meaning “lonely pub”, we move forward on the gradual path to the Kali Gandaki river bed for about three hours before reaching Ekle Bhatti village. 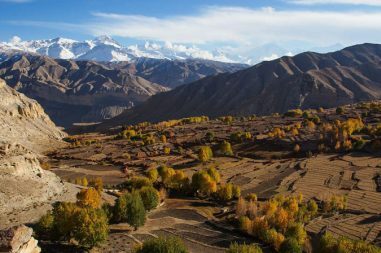 Stopping here for a while, we walk an easy trail for about one hour to arrive at Kagbeni which lies at the bank of two rivers and is an interesting windswept village on the main age old Trans Himalayan salt trade route to Tibet via Upper Mustang area. The trek starts with a special permit check up and onwards to the riverbank of Kali Gandaki up stream climbing steeply to re-join the direct trail leading to Khingar at 3,200m passing through a desert landscape till we arrive at Jarkot village from where further ascend will take us to Muktinath. One of the most popular destinations for Hindus and Buddhists pilgrimage, Muktinath is also considered as “Muktikshetra” by the Hindus, meaning the “place of liberation or salvation”. The water spouts channeled for the stream are considered sacred and the pilgrims make sure to bathe under each one of these spouts. Also, nearby the temple is a Buddhist monastery. After the temple visit and exploration of the area, the trek from Muktinath to Jomsom begins. On this last day, you can trade emails and photos with other participants before being accompanied to the airport approximately three hours before your scheduled flight.